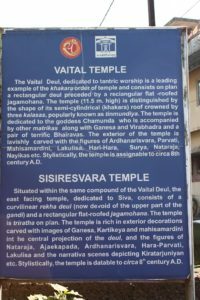 Introduction – Another small village for our quest of cave temples. Kilmavilangai is a village near Tindivanam in Viluppuram district of Tamilnadu. This cave temple is located on outskirts of this village.I stand here for the eternity, is referred to a Vishnu image where he is shown standing amidst the green fields. Cave Temple – This cave is excavated on a small boulder which looks like low outcrop in middle of the fields. On the eastern face of this outcrop, is carved in a single cell. The total cut in measures about 4.5 feet by 5.5 feet, the cell within is about 2.5 feet by 5 feet and about 3 feet deep. This way we get two jambs, one on each side of the entrance. On these lean jambs are carved two dvarpalas, or better we say only the outlines of the dvarpalas are carved. The entrance is secured by an iron gate, which was installed when A H Longhurst visited in about 1930. Can we say that this cave was excavated during Mahendra’s reign? In all the caves of Mahendra, where his foundation inscriptions are found, we did not see any relief sculpture inside the cell. This is pretty sure that this cave was not executed by the orders of Mahendravarman, in that case this must be a later excavation, but how much later? In appearance this cave is just a cell, no mandapa to support this cave. Such kinds of excavations are seen at Mahabalipuram so we may say that probably this excavation was also carried out during that time. It seems to be done by some local village or town chief, not at all on some royal order. K R Srinivasan assigned this to early times of Rajasimha on the basis of the Vishnu image style. However assigning such a simple cell to so later period seems very farfetched. Yes agreed that the image style is not similar, however cannot there be other styles in use, also when the excavation is not on any royal order, the sculptors are free to use their ideas. 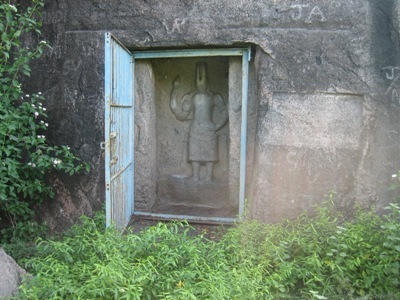 Dvarapalas of the cave – There are two dvarpalas on door jambs, however there outlines only are carved. Both are holding a flower in one of their hands. Inscription in the cave – No inscription is found in this cave. How to Reach – Kilmavilangai is about 10 km from Tindivanam town, on Tindivanam-Vandavasi road. On your right side, you will see an arch, of Kilmavilangai town, where you need to take right turn. The cave is located not far off from that turn, on your left side.